What's that? You want more obscure Citadel miniatures to populate the Vengeance of the Lichemaster? Have you done your chores? Have you watered the gimp? Walked the polyp? Recited the Litany Against Fear? Well OK then. You deserve this. Last week we looked at the Wizard Monks of La Maisontaal, the monastery dedicated to Taal that lies at the heart of the Vengeance of the Lichemaster scenario from 1986. 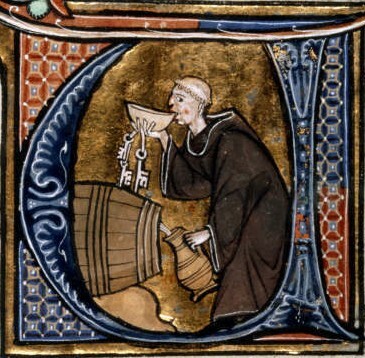 In addition to his five magic users, Bagrian the Abbot also has a complement of twelve Warrior Monks. The scenario (by Rick Priestly) tells us that "The warrior monks of Taal are young monks not yet judged able to progress to magical tuition. However, they are by no means ordinary men. Years of mental preparation and study on the martial arts has given them considerable fighting abilities as well as unusual mental fortitude." 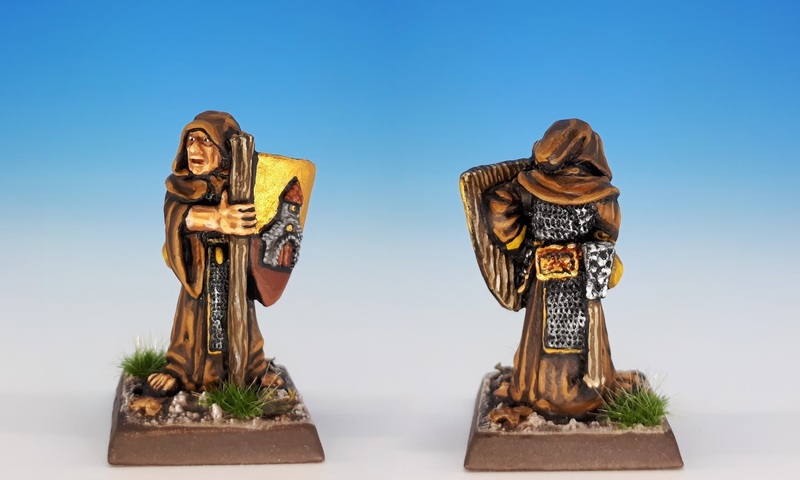 As with the Wizard Monks, the Warrior Monks provides a great excuse to delve into Citadel's extensive back-catalog of Clerics that flourished from 1983-1986. First up is the C03 Cleric "Ivory Temple" sculpted by Bob Naismith in 1985. He's distinctive for his detailed facial expression and the gorgeous temple carved into his shield. 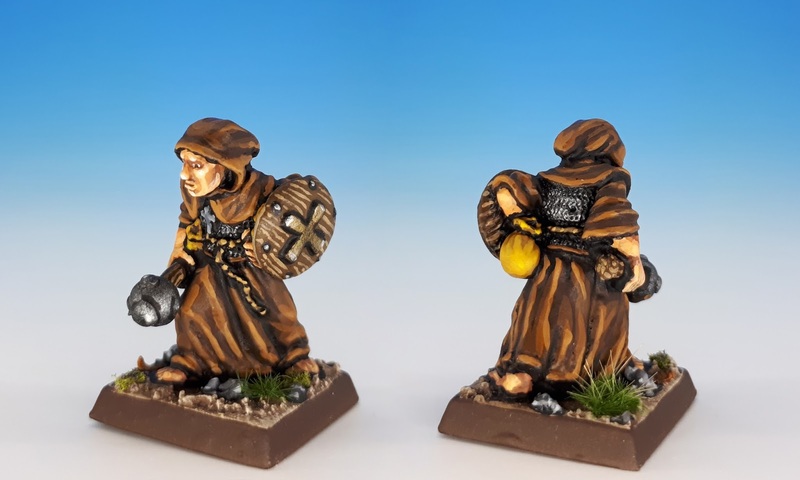 This is also the only miniature specifically portrayed as a Warrior Monk in the advert for The Vengeance of the Lichemaster, which means that he can be hotly demanded on eBay. I also wanted to try to conjure up a mystical sense of an otherworldly place. 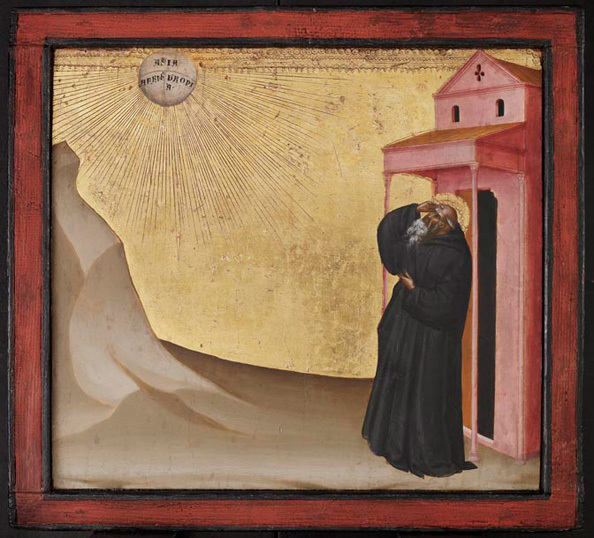 Luckily the technique is pretty simple: a nice smooth coat of gold paint without any highlights or shading as the sky, contrasted to an earthy foreground. Say what you will about Trish's sculpting style, but it's distinctive. And that counts for a lot in my book. 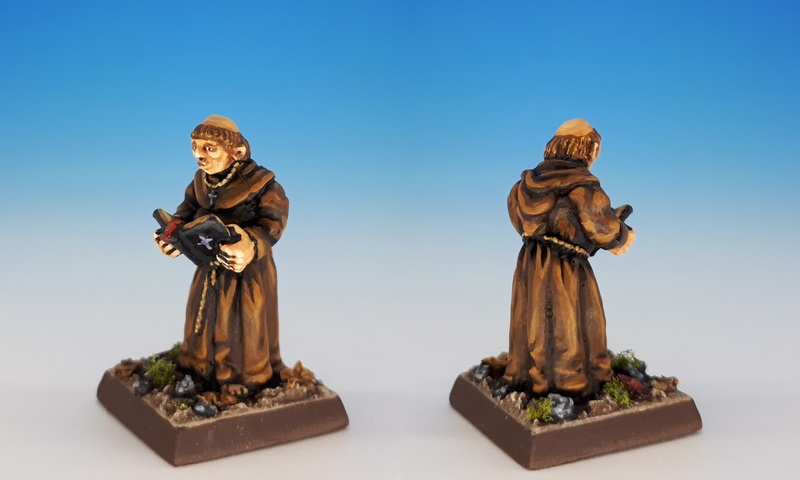 Here is the "Friar" from the C03 Cleric released by Citadel in 1983, sculptor unknown (although I suspect it's Bob Naismith). I love the simplicity of these early solid-base sculpts. There aren't so many buckles, scabbards, pouches, straps, skulls jewels or scrolls, leaving greater focus on the face. The above illumination is from MS Bodley 265 (14th century) in the Bodleian Library (Browse the entire manuscript here and hat tip to the Minnesotastan for the image). 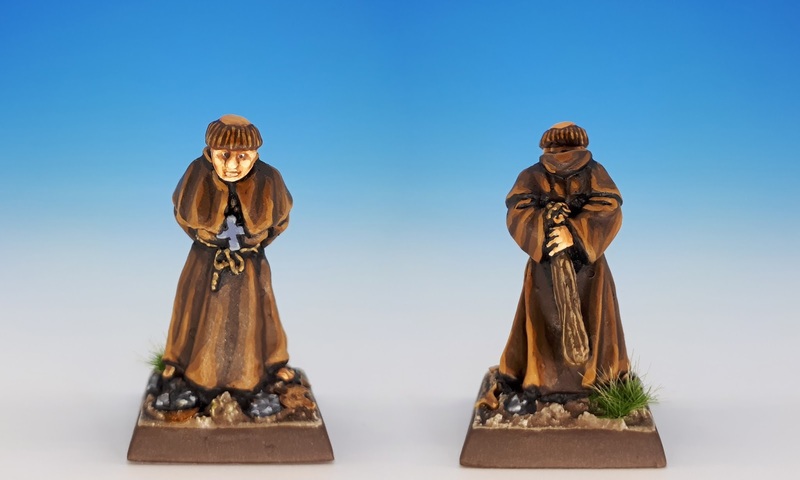 As our last miniature today, here's the C03 Cleric "Red Robe"sculpted by Bob Naismith in 1985. This Cleric adventurer has a great sense of forward momentum, complemented by a determined face. Stay tuned for next week, when we'll look at the rest of the Warrior Monks, including their leader, standard bearer and musician. Superb painting, and the mix figures-old pictures is a great idea...a wonderful post! Oh my god! Fantastic work Matthew! Love it! Splendid, I really love the idea of plain gold for background. It really conveys the right vibe. I'm eager to see the rest ! That is an ambition of mine! How did you do the flag? It's amazing! I get very little credit for the flag because it's a transfer from Little Big Man Studios. 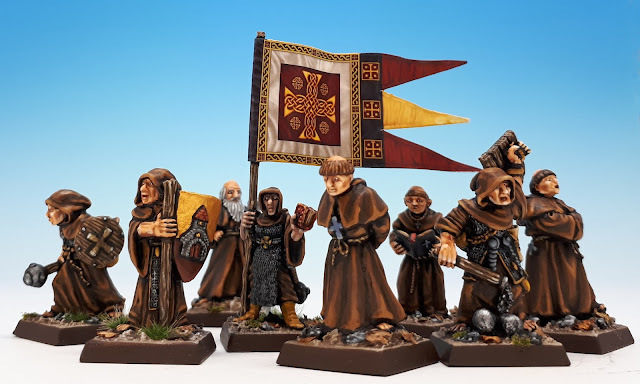 I usually do my own banners, but I have a secret plan to use some of these monks for Saga, and I like using the LBMS banners for my Saga armies. Great post - I love the inclusion of historical art. 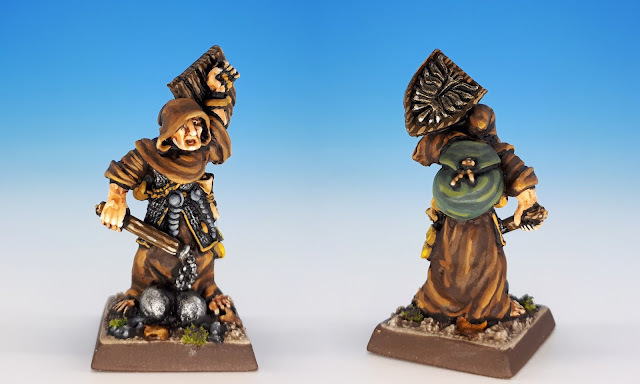 Many years ago I had a Chaos Cultist Regiment of Renown and some of the figures looked very similar to a few of those monks - I think they had grotesque masks on though? Those are GREAT models. The masks are sort of like Carnival masks, as I recall. Sadly I sold mine about 21 years ago!!! Absolutely glorious work Matthew. I love that you've taken inspiration from medieval artworks. Wow. The work on the robes is excellent, but the mere concept of the shield is daring and mindblowing. It really adds a medieval vibe and opens a world of possibilities. Bravo! Fantastic post! Your monks look outstanding. Brilliant work on some quirky and charming models! Lovely stuff. The cleric range is pretty cool - at one stage I was collecting them but gave up as it was too expensive. Even managed to paint a few of them although a number have been cleaned and undercoated but nothing more. It's a huge range -- I imagine it would be *very* expensive to get them all. I absolutely love them! 2 questions, how'd you do the brown robes? And any tips for the little big man banner? 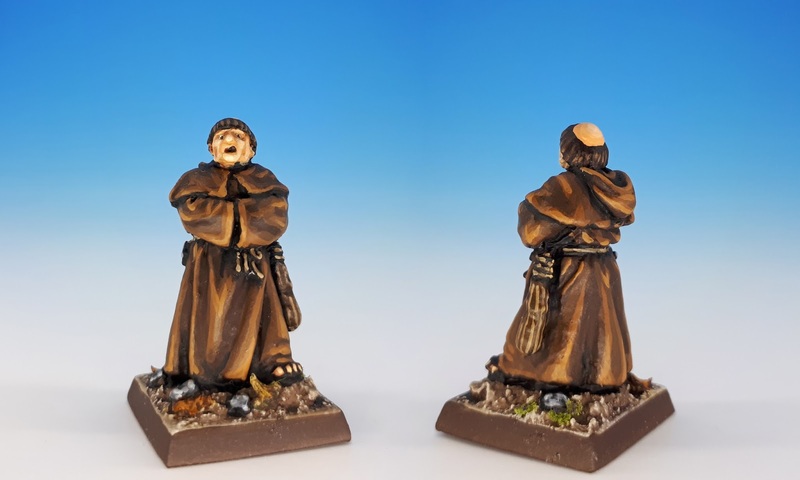 Robes were dead simple: primed black, basecoat of Vallejo Charred Brown, then highlights of an increasingly light blend of Charred Brown and Beasty Brown, and then a final highlight of Beasty Brown with a little Bronze Fleshtone. As for the Little Big Man Banner -- my only advice is to be careful. I ruined the first banner I tried to use (it's from the Breton Army list) because I couldn't properly peel it off the plastic. I also find (and this is no surprise) that their banners only look good if you spend some time painting the edges of the banner to match the pattern on its face. Thanks everyone for the lovely feedback! I'm glad you like these simple monks. More to come! This right here, "I love the simplicity of these early solid-base sculpts. There aren't so many buckles, scabbards, pouches, straps, skulls jewels or scrolls, leaving greater focus on the face." so damn true. If I ever came into money I'd higher some of the artist whose work I love but can't stand their added belts, buckles, daggers, etc... and do some clean work. Great stuff. I think those Monks could really benefit from red, drunken noses! That is a splendid idea, GD! What a terrific looking group of clerics Matt! 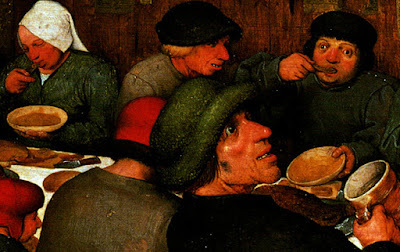 They do have that hard-bitten Breugel/Bosch look about them. We're currently in Antwerp right now and am seeing many sights which remind me of those heady days of playing Warhammer in the Olde World. Keep up the wonderful work.